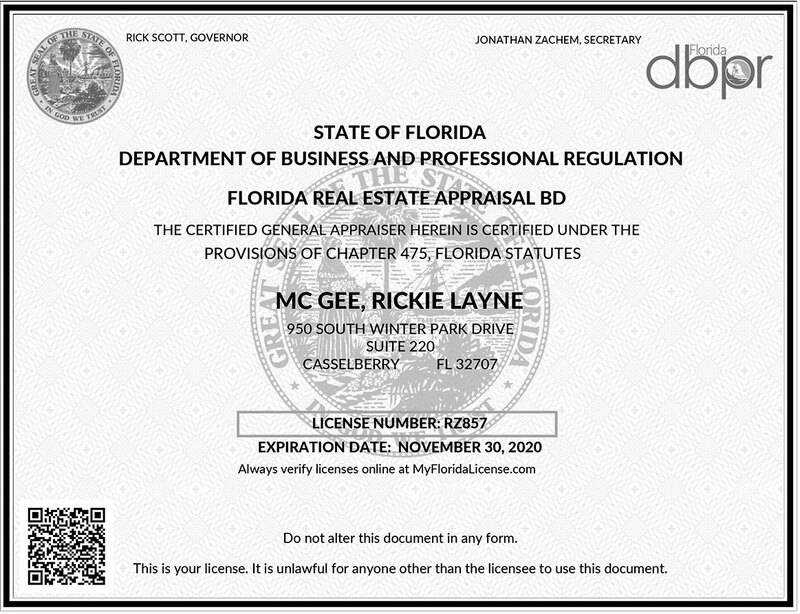 QUALIFICATIONS OF RICK L. MCGEE, MAI | Chief Appraisal Services Inc.
Commercial real estate appraiser with over 30 years of experience; appraisal assignments have included single and multiple tenant medical and professional offices, industrial properties, anchored and unanchored retail centers, tourist retail, full service and quick service restaurants, schools and daycare centers, churches, and vacant land. Significant expertise in the valuation of lodging facilities since 1990; have completed over 250 narrative hotel reports throughout the State of Florida. Lodging assignments have covered a wide spectrum, from large, luxury resort and convention hotels to small bed and breakfast inns, and including proposed projects, renovations, and franchise conversions. Services include consultation, appraisal review, and preparation of narrative appraisals of most types of commercial real estate. Activities included marketing, managing, reviewing, and preparing appraisal assignments; administering performance reviews to employees; and as a Board of Director assisted in company management. Certified under the continuing education program for Designated Members of the Appraisal Institute. Completed numerous appraisal related courses through the Appraisal Institute and other organizations.